Besides the Lay Centre’s own chapel, the closest church is actually the Basilica of Saints John and Paul of the Cross, attached to the Passionist Monastery that is our landlord. However, given the geography and the means of getting around the property, it is actually closer to go to the local parish church, the Basilica of Santa Maria in Domnica, also known as Santa Maria della Navicella. First, a little perspective is in order. Growing up in rural North Bend, WA about 30 miles east of Seattle, the nearest parish was a 15 minute drive away, in neighboring Snoqualmie. 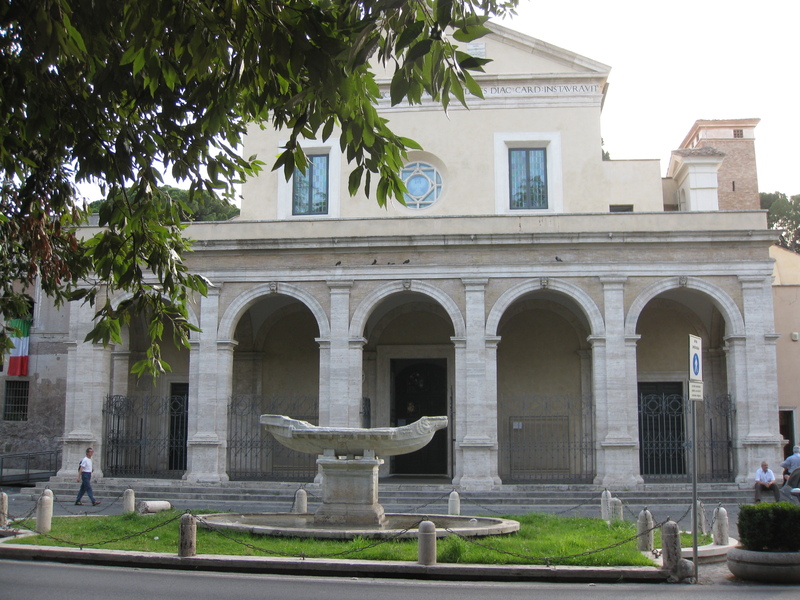 Within a 15 minute walk from the Lay Centre, there are about a dozen churches, including the Cathedral Archbasilica of San Giovanni Laterano, the ancient San Clemente, one of Rome’s three circular churches, San Stefano Rotondo, and a chapel for the Missionaries of Charity. I am still making my rounds! The parish church derives its dual names from different features of and around the basilica. In front of the church is a marble statue of a small ship (navicella), turned into a fountain by Leo X in the early 16th century as a replica of the original, which had been there ‘since time immemorial’. The official name of Domnica is variously attributed, either in reference to the church as a “house of the Lord” or to the name of a wealthy patroness who lived in the area whose name translated also meant “of the Lord”. Originally built somewhere between the 4th and 7th century on the ruins of a military barracks, it was renovated by Pope Pascal I in the early 9th century, and it was again refurbished by Pope Leo X in the 16th century. Pope Pascal was also connected to the Basilica Santa Prassede, which I mentioned a few weeks ago, also known for its beautiful mosaics, including that of Pascal’s mother, Episcopa Theodora. In Santa Maria Domnica, the mosaic represents an icon of the Theotokos and Christ child, correctly situated in the center rather than at his mother’s side, flanked by saints and angels. 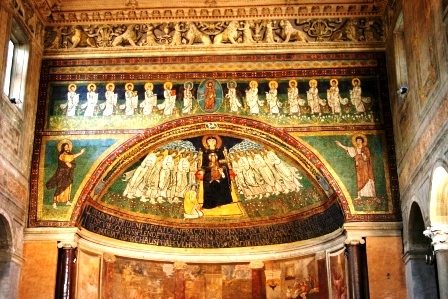 Pope Pascal is seen at Mary’s feet, with the square halo indicating he was still alive when the mosaic was completed. The cardinal-titular of the church is William Cardinal Levada, prefect of the Congregation for the Doctrine of the Faith and former Archbishop of Portland and of San Francisco (and before than an auxiliary under Cardinal Mahony in LA). The basilica also serves as a parish center for the lay movement, Comunione e Liberazione (Communion and Liberation). Communion and Liberation is one of the many lay ecclesial movements that have been popular in the Italian church and elsewhere in the last 40-50 years. While lay ecclesial ministry developed along the same timeline in northern Europe and North America, these lay ecclesial movements took precedence in Italy and in many of the Latin countries. CL traces its origins to the thought and ministry of an Italian priest Luigi Giussani dating back to the mid-50s, but the movement itself has its identifiable beginning with to a small group of Giussani’s students in 1969. The model is less of definite membership than in attendance in weekly catechetical meetings known as the “School of Community”. Estimates are of about 100,000 attending regularly in Italy, and there is a presence in almost 80 other countries, though nowhere as strong as here in Italy. For both the feast of the Immaculate Conception, today, and the celebration of the Second Sunday of Advent I joined a group of my housemates from the Lay Centre in participating in the liturgy here. I just did not feel like braving the rain and the Roman crowds (and pickpockets) to make it to the Piazza Spagna for the Papal event there. Maybe next year! By A.J. Boyd in La vita Roma on December 8, 2009 . Stunning affair, I did not thought reading this was going to be so amazing when I read the link! !